The B250 is an aptly designed ‘B’ tyre range from Bridgestone, specifically intended for Indian road conditions. The tyre offers an amazing sense of balance and gives you a quiet and smooth ride every time. It has been designed with grooves plus sipes in the centre to disperse water when driven on a wet and waterlogged road surface. This helps it perform excellently under rainy setup by preventing it against hydroplaning. This all-season tyre ensures a high level of traction in dry conditions and at the time of sudden braking on long routes. The unique rubber compound at the tread of Bridgestone B250 provides durability, longevity and uniform wear throughout life. The dry performance of the tyre, including cornering plus firmness, is boosted by finely connected solid shoulder blocks. It has structural features like the two plies on its sidewall and cap over steel belt so that the tyre delivers greater elasticity on roads ensuring comfort to the occupants. 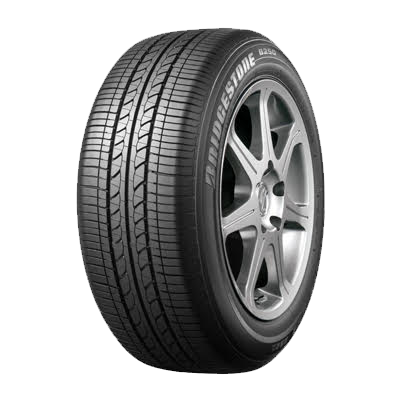 Bridgestone B250 is also an OE tyre for many leading car manufacturers in India. The rigid rubber compound at the base of Bridgestone B250 ensures smooth response, consistency and upright stability. The reinforced sidewalls of B250 provide a high level of steering response on longer routes. The rubber compound used in Bridgestone B250 gets full spiral caps and continuous nylon wrap. The tyre provides uniform wear and innovative tread assists in holding its original shape, resulting in enhanced performance for long. Additional protection on shoulders is provided in the form of extra rubber to avoid cut risks and offer protection against roadside hazard damages. Bridgestone B250 is one of the prominent aftermarket tyres as well as a trusted OE tyre for many passenger cars in India. The extensive size range of B250 tyres caters right from entry-level cars to premium sedans and crossovers in India.